Esterbrook FJ and Wordathon ballpoints can now be made to write again without any messy cleanout of old refills. With the aid of several people, there is now a 3D printed adapter that accepts a ballpoint mini refill to bring these old ballpoints back to working order. With the adapter installed, the click action works as intended. 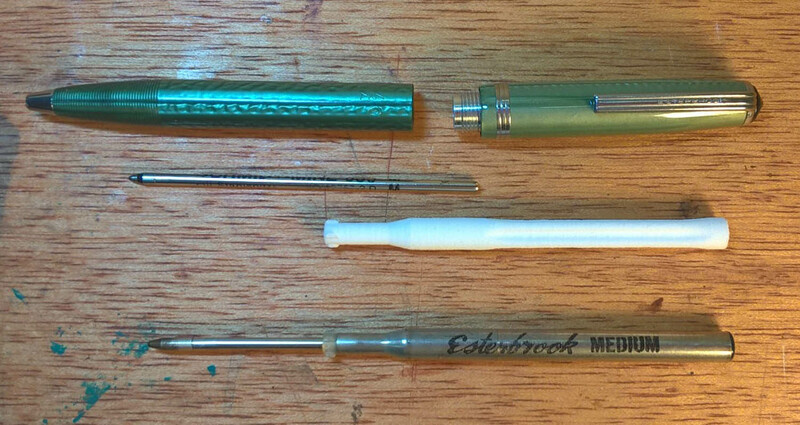 I assume, but have not tested, this adapter in any other Esterbrook pen, but if it uses the same original refill as the one pictured below, it should work. If you are interested, the adapter is available to be printed for you by Shapeways. You can find it at https://www.shapeway...m/shops/bamapen It costs $6 plus your actual mailing cost. Edited by BamaPen, 11 May 2016 - 00:10. I love carrying an FP and BP set in my shirt pocket, and will be very pleased for it to be an Esterbrook pair now. I'll have to try one of those. I have a ballpoint or two waiting in my box. Thanks! After a lot of fooling around with the two ballpoints I had, I threw them away to keep from wasting any more time on them. Then this comes along. I think this is some part of Murphy's Law. I just got an LK (Deluxe) ballpoint configured with one of these. Working great so far. I will report back after some real world use. Bill M reported that a tiny bit of silicone grease applied on the ratchet teeth and also on the very tiptop of the adapter made his Estie ballpoint work very smoothly. After so many years, I'm not surprised that a little lubricant helped! Everyone must have ordered, and received, theirs on the same day! I also got mine yesterday, and it works nicely. This was my first time actually getting a ballpoint working (I never threw mine away ), and the only difficulty I noticed was getting the ink cartridge into the holder. A quick run of a drill bit might smooth things out a bit, but I'm happy with this. There's only one problem....I now have a copper pencil (with advertising), a copper ballpoint...but I don't actually have a copper fountain pen in my little collection. I'm very happy to have a working Esterbrook ballpoint! Yes, getting the ink cartridge into the holder was a pain. I ruined two refills before my little brain latched onto using a drill bit to give the refill just a tiny bit more room to slide in to the adapter. I added a note on the Shapeways product description saying that a 3/32" drill bit will clean out the hole for the mini refill. The hole is the right size in the 3D digital model, but the printing process leaves the surface a little bit "grainy" and the drill bit will clean that up easily. White Strong & Flexible: White nylon plastic with a matte finish and slight grainy feel. This material is incredibly versatile, and can be used for a wide variety of applications, from iPhone cases to jewelry, remote controlled quadcopters to wearable bikinis. When thin, it's flexible enough for hinges and springs. When thick, it's strong enough for structural components. If you are getting some dust from it, I think it is possible that the rotating action in the pen may be scrubbing a little bit of the grainy surface of the ratchet teeth. If that is the situation, then the dust-making should stop when the grainy surfaces have become polished. The adapter material is nylon, so it should have a long life. I think Bill M's suggestion to apply a tiny bit of silicone grease to the ratchet teeth and the very tiptop of the adapter may eliminate this problem. No more dust, so I suspect you are right BamaPen. The only remaining 'issue' I'm finding is one I find with many early BPs. It is that if you don't _fully_ depress the action, the retract mechanism will often not work. It is odd, too. The advance mecanism seems to work without fail, but if you only push, say, 3/4 of the way to try to retract the point, it often will not retract. Happens all the time with 1st year jotters for me too. Not sure why that is. Easy fix: always push the action all the way down. Bill, I looked at the Space Pen items, but can't find any information on the diameter of their refill. If it happens to be the same as a mini refill, then it may be possible to alter the 3D model to incorporate a much deeper hole into which the Space Pen refill would fit. That would give a superior writing result for sure. We can't tolerate a larger diameter, though, because there is very little material at the end of the adapter to support the four toggle teeth, plus the mini refill just barely fits thru the opening in the nosecone of the Esterbrook. A quick check with a couple of typical ballpoint refills shows that they won't fit thru the opening and that they would eat up all the structural support for the toggle teeth. The cylinder around the toggle teeth can't get any larger or it won't fit through the opening inside the Esterbrook. I think I'm going to try one next week. You can break off the space pen refill to appx. 2 5/8" which is the same length as the mini refill, if I remember correctly.